A new four-page, full-color flyer from Action Floor Systems provides an introduction to the company's extensive line of solid-maple hardwood sports floor systems. Included is information on Action Floating, Fixed and Fixed-Resilient systems, along with detailed cross-section illustrations of selected floors. Action Floor Systems manufactures a wide variety of hardwood sports floor systems to provide for any application. The company specializes in high-performance sports floors constructed of hard maple timber. With the addition of Herculan® polyurethane synthetic and Action ReFlex recycled rubber flooring to its product line, Action Floor Systems is a single-source flooring supplier for any athletic or multipurpose situation. Safe Structure's TuffShellTM Top Coat, an aqueous-based coating specifically designed to extend the life of existing pour-in-place and rubber tile floors, provides a cost-effective and easy alternative for replacing playground and recreation area surfaces. A polymeric top dressing, TuffShell Top Coat is designed to serve as a short-term solution for repairing old and worn pour-in-place surfaces at playgrounds, waterparks, tennis courts and running tracks. Easily applied with a paint roller, the coating can extend the life of these surfaces by two to three years, while adding a fresh coat of protection and color. In an effort to combat the growing issue of obesity, Life Fitness is providing comprehensive fitness programming to the students of Albany Park Multicultural Academy, a Chicago Public School, through its Circuit Series strength-training system. Circuit Series is a space-efficient line of 11 strength-training machines designed to deliver time-efficient, total-body workouts in a non-intimidating, easy-to-use format. As part of the partnership, Life Fitness is providing programming support and ongoing education through the Life Fitness Academy to bring workout routines for the students to use and the faculty to administer. Modern Pool Systems now offers a complete aluminum forming system for the creation of retaining walls for recreational facilities. The forms are designed for concrete-poured retaining walls with a modular system so builders can easily pour geometric and free-form shapes. These forms are stackable for higher pours and are ideal for raised pool walls, water features and multi-deck levels. The forms are easy to clean and capable of pouring more than 2,500 walls. 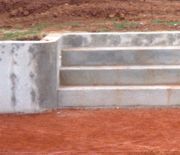 Great for building concrete steps, benches and seating areas for recreational facilities. SeaKlear® has just published a new book titled "The Swimming Pool Professional's Guide to Recreational Water Illness." The comprehensive how-to reference book provides background information on the various contaminants and causes of recreational water illness (RWI) and how they can lead to an RWI outbreak. The book also provides detailed information on preventing, treating and removing these contaminants and a "troubleshooting guide" that provides a quick reference for pool operators. The book provides scientific background explanations of RWI causes and was designed for pool professionals looking for a master reference manual on RWIs. Now contractors who own Bobcat® mini track loaders and small skid-steer loaders can carry trees, rocks and other materials more efficiently with the new tree fork attachment from Bobcat Company. The Bobcat tree fork attachment is ideal for landscapers and nurseries that must frequently transport balled, potted and burlap-covered trees and decorative landscape rock, or any contractor who must move heavy, odd-shaped objects. The attachment is approved for use on Bobcat MT52 and MT55 mini track loaders and Bobcat 463 and 553 skid-steer loaders. Operators can quickly attach the tree fork using the Bob-TachTM mounting system. Shade is an increasingly important aspect of protection while at play. This is why GameTime is exploring new ways to beat the heat. The new 20-foot and 14-foot SunBlox roofs offer relief from the sun while giving the structure a sleek new design component. SunBlox roofs add a streamlined effect to the playground and its surroundings. Their sturdy design allows kids to play comfortably in areas that may have previously become too hot during peak hours of sun exposure. SunBlox roofs are available in a single-piece fabric cover or in a sail design that integrates four fabric panels into one cohesive design. Newstripe introduced the improved Drag King infield groomer. This unique machine features a three-section design that combines the grooming capabilities of conventional hand-pulled mats with the field-conditioning capabilities of units costing thousands of dollars more. The Basic 2 section model, pulled by hand without weights, quickly grooms base lines and infields to a ready-to-play state. Add the scarifier/ballast box section and weights, attach to any lawn and garden tractor or utility vehicle, lower the reversible scarifier/planing blades, and take up to a 1-inch deep cut to bring rougher fields back to like-new shape. Newstripe also manufactures a complete line of striping and marketing equipment and stencils for athletic fields and pavement.